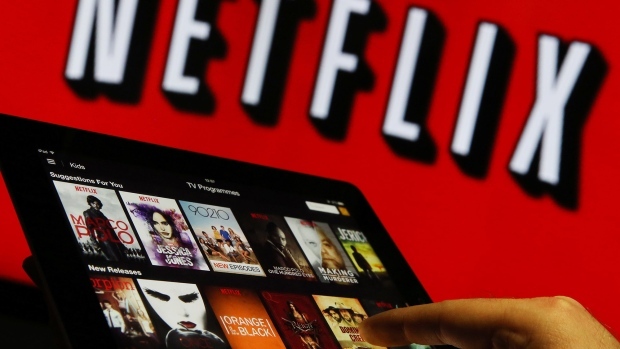 At least one investor is placing a bullish wager on communications stocks leading up to Netflix Inc.’s (NFLX.O) earnings report Thursday. The US$3.8 billion Communication Services Select Sector SPDR Fund, or XLC, took in over US$662 million on Wednesday, the most since October. A large chunk of that appears to have come from one trader, who bought close to 5 million shares worth more than US$223 million. XLC started trading in June, after indexers S&P Global Ratings and MSCI Inc. reorganized the Global Industry Classification Standard, or GICS, structure by combining phone companies with some internet and media stocks into a new sector called “communication services.” The fund’s largest holding is Alphabet, which comprises about 23 per cent of the portfolio, while Netflix is the third-largest position at close to 6 per cent. Investors are putting their money in riskier areas now that the Federal Reserve has taken a more dovish stance on future interest rate hikes, according to Matt Schreiber, president and chief investment strategist at WBI Investments. 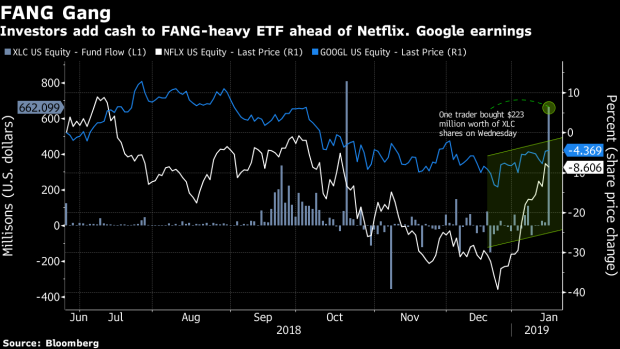 A slump in Apple Inc. shares revived interest in the original members of the FANG trade (as opposed to the FAANG group that includes the iPhone maker), as Facebook Inc., Amazon.com Inc., Netflix and Google have all gained anywhere from close to 11 per cent to 50 per cent since Christmas Eve. All except Google have outperformed the S&P 500’s 11 per cent advance over the same period. Netflix hits like the Sandra Bullock film “Bird Box” have helped fuel rising expectations for subscriber addition, which will be revealed in its fourth-quarter earnings. Google reports its results on Feb. 4.